Objective: INDUSTRIAL INSTRUMENTATION LABORATORY OF ELECTRONICS AND INSTRUMENTATION DEPARTMENT IS DESIGNED AS PER THE INDUSTRRIAL RECENT PROCESSES AND STANDARDS. 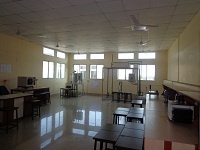 THIS LABORATORY GIVES A CLEAR PICTURE OF AN INSTRUMENTATION AND AUTOMATION INDUSTRY.A NUMBER OF EXPERIMENTS RELATED TO FLOW MEASUREMENT WITH VARIOUS SMART SENSORS, LEVEL MEASUREMENT, TEMPERATUTE MEASUREMENT OF BUFFLE FURNACE, MOISTURE MEASUREMENT, VISCOSITY MEASUREMENT CAN BE PERFORMED IN THIS LABORATORY. ELECTRONIC INDICATOR DISPLAY PLANELS ARE ATTACHED TO EVERY INDUSTRIAL SETUP. THE PROCESS PARAMETERS ARE INTERFACED WITH THE PERSONAL COMPUTERS WITH NATIONAL INSTRUMENT BASED DATA AQUISITION CARDS. FURTHER DATA ANALYSIS CAN BE PERFORMED USING NI LABVIEW SOFTWARE. Objective:SENSORS AND TRANSDUCERS LABORATORY IS ONE OF THE SOFISTICATED LABORATORY OF ELECTRONICS AND INSTRUMENTATION DEPARTMENT. 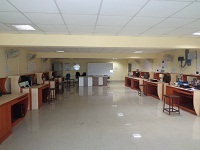 THE LABORATORY IS DESIGNED ON THE CONCEPT OF VIRTUAL INSTRUMENTATION. MEASUREMENT AND CALIBRATION OF VARIOUS SMART SENSORS WITH THEIR REQUIRED COMPLETE SETUP ARE PERFORMED AND THE NATIONAL INSTRUMENT DATA AQUISITION CARDS ARE INTERFACED WITH PERSONAL COMPUTERS. DATA ANALYSIS IS PERFORMED BY LABVIEW SOFTWARE IS INSTALLED IN THE PERSONAL COMPUTERS. Objective:THE MAIL FOCUS OF THIS LABORATORY IS TO MAKE OUR STUDENT AWARE OF ASSEMBLY LANGUAGE PROGRAMMING WITH THE HELP OF 8085 AND 8086 INSTRUCTION SETS. THIS MICROPROCESSOR (8085, 8086) CAN BE INTERFACING WITH NUMBER OF PERIPHERALS LIKE LED MODULE, 7-SEGMENT DISPLAY MODULE, STEPPER MOTOR & SERVO MOTOR MODULE ETC EXPERIMENT CAN ALSO BE PERFOMED ON MICROCONTROLLERS (8051) WHICH ARE INTERFACED WITH PERIPHERALS LIKE LED MODULE, 7-SEGMENT DISPLAY MODULE, STEPPER MOTOR & SERVO MOTOR MODULE ETC. 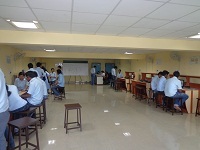 IN THIS LABORATORY SEVERAL MICROCONTROLLER BASED PROJECTS ARE DESIGNED AND IMPLEMENTED.